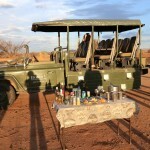 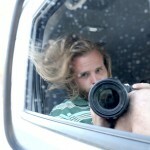 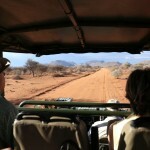 My Namibian adventure would come to a close on a high note! 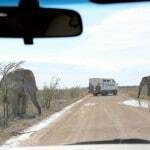 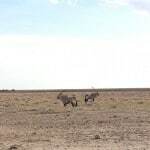 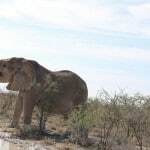 We were headed north from Damaraland to Namibia’s Etosha National Park, the countries wildgame crown jewel where visitors enjoy the thrill of coming face to face with elephant, lion and meandering giraffe. 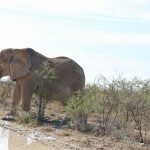 It was perhaps fitting that exactly a year ago I enjoyed my first trip to Africa to visit South Africa’s Kruger National Park, life comes full circle even when you least expect it. 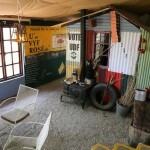 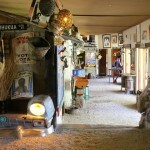 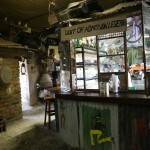 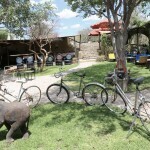 I was eager to stretch my legs after a long drive when we stopped for a quick lunch at Etosha Safari Camp which features a funky restaurant in the classic local shebeen style. 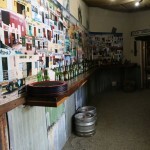 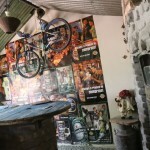 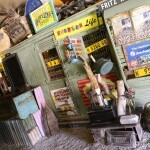 The space is decked out in antique dolls, vintage posters, national flags, empty bottles of whisky and used tractor tires which double as stools. 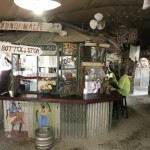 In Southern Africa, shebeens are most often located in townships as an alternative to pubs and bars where under apartheid indigenous Africans were barred. 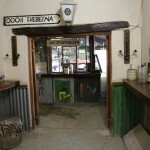 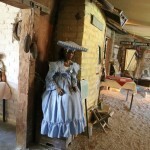 Originally shebeens were operated illegally by woman, called “Shebeen Queens” these ladies would sell homebrewed and home-distilled alcohol and provide patrons with a place to socialize with other members of the community. 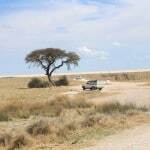 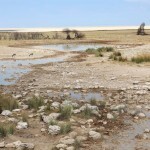 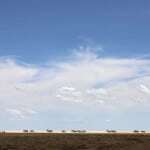 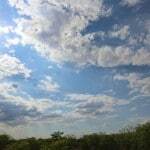 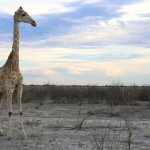 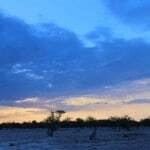 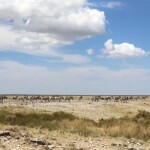 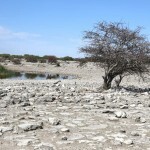 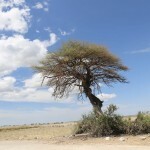 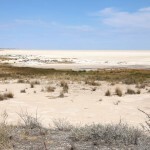 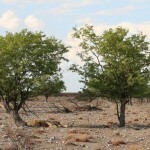 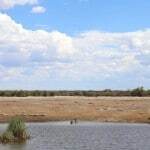 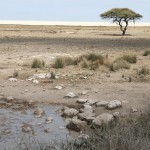 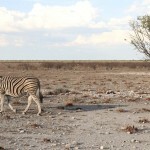 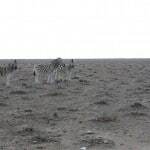 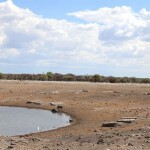 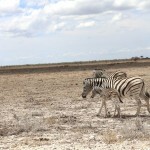 Etosha National Park is a huge saltpan surrounded by flat bushland. 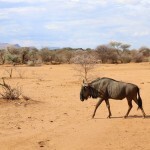 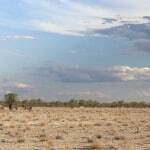 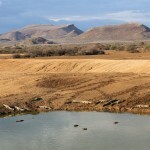 The water holes, scattered throughout this area, are the basis of life for countless game. 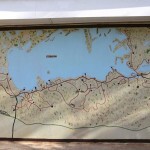 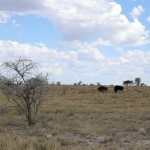 Almost all African animal species are represented in the huge nature reserve which is approximately 22,000 sq km in size. 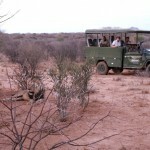 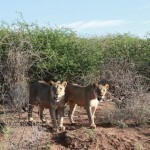 There are an estimated number of 300 lions, 200 rhinos, 2000 giraffes and 1500 elephants in the park. 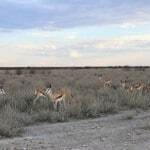 Particularly numerous are the dainty springbok, of which at least 30,000 can be found prancing about in enormous herds. 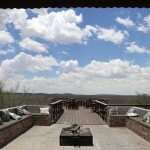 I slept myself silly in a spacious suite at the luxurious Mokuti Lodge which sits a stones throw outside of Etosha National Park’s eastern entrance at the Von Lindequist Gate. 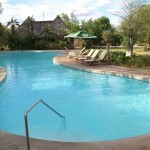 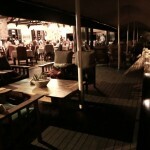 The property features a decadent spa, fine dining restaurant and breezy bar which overlooks a refreshing swimming pool duo. 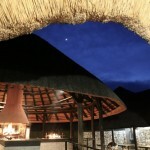 Mokuti is a truly African-style lodge, with its lofty thatch roofs, cool stone floors and rotating fans, the atmosphere is tranquil yet guests also have the thrill of wandering upon wild giraffe and oryx which eagerly feed on the properties lush greenery. 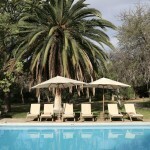 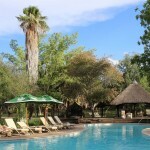 The lodge has won the Namibia Best Hotel award for three consecutive years, so do yourself a favour and treat yourself. 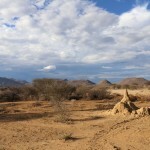 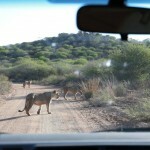 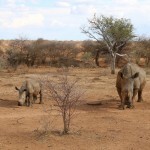 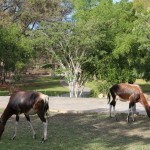 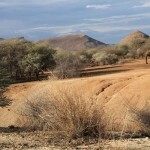 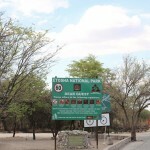 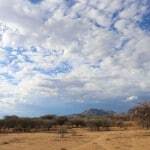 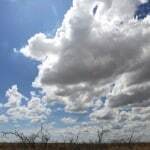 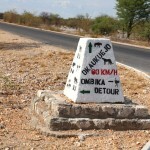 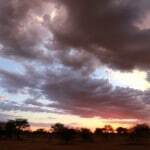 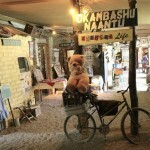 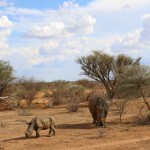 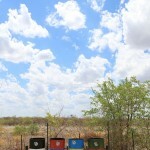 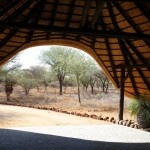 After spending two days exploring Etosha’s public park by van we headed south towards Windhoek. 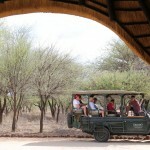 The group arrived at Erindi in the early afternoon, a stunning private game reserve and luxury lodge which sits on over 70 000 hectares of pristine wilderness, and presents an amazing array of diverse landscapes – from golden savannah to desn bush with mountains, natural waterholes and grasslands. 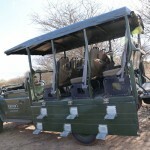 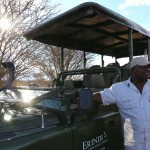 Unlike Etosha National Park where visitors are not permitted to drive off the main road, guides who drive Erindi’s open air vehicles zoom off-road and allow guests to get up close and personal with lions, rhinos and elephants. 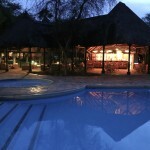 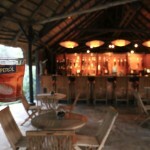 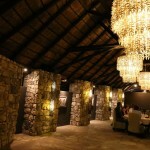 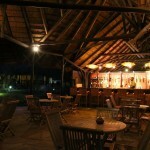 The properties Old Traders Lodge is the perfect place for hungry guests to sip and nibble while thirsty rhino and elephant stop by for a drink at the watering hole below. 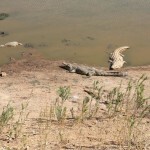 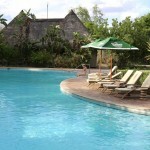 If you look closely you’ll spot the fluttering of hippo ears and quick snap of crocodile jaws. 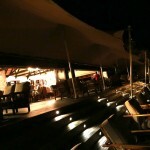 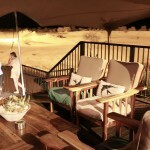 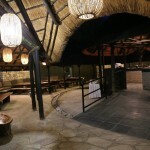 Sip your glass of champagne, watching your final Namibian sunset from a comfy couch on the patio. 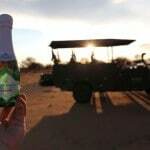 You’ll find that at Erindi, mother nature reveals herself to those who press her closely.